An AI opponent is available for this game! xoet 2 this is the best game I have played I think it is better then chess. CDRodeffer 1 Byte is a tactical game where the most important elements appear to be tempo and parity. 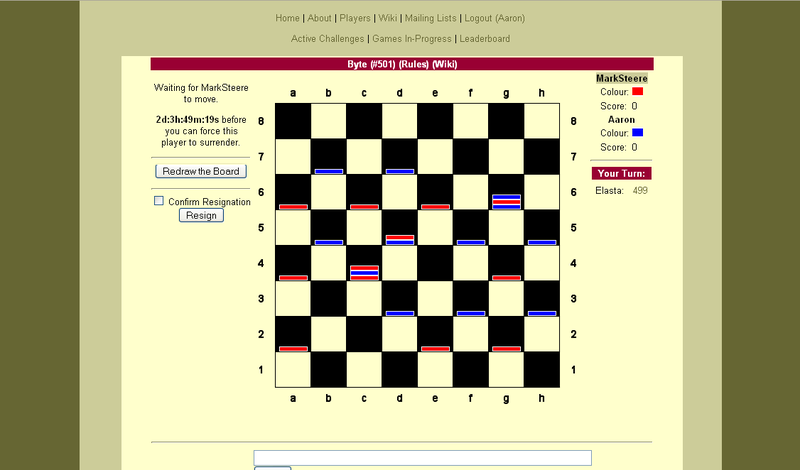 Winning usually happens by one player forcing the other into zugzwang. 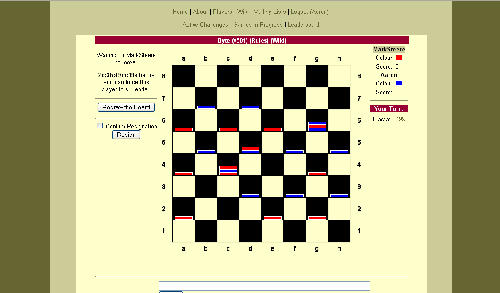 aliceabusmus 0 I'm not sure the opening is any more opaque than standard checkers to a beginner. After a few games, I'm guessing there are starting positions that make it easier to see a few moves ahead. In checkers, all your non-kings move the same direction making it easier to see all your possible moves at a glance rather than having to work out which is the closest piece to which. Laurie_Menke 0 If you like chess, you'll probably like Byte. Hedge_o_Matic -1 This game sounds fun, but it isn't. nycavri -1 A brain burner. unic -1 Byte has interesting bits... but is too opaque, and tends to become more of a puzzle than a game. Cerulean -2 Painful to play. The learning curve is nearly vertical. Byte may be deep and subtle, but it's far from fun.